Top 10 street bikes under INR 1 lakh considered here are those options that have no capable rival standing in front of them. The range starts from Suzuki Gixxer with INR 78,316 of price tag (ex-showroom Mumbai). The motorcycle is truly focused on value for money principle, even leaving the commuter spec xBlade behind by a good margin. The third one, Yamaha FZ-S, also comes with a rear disc brake option like the Suzuki Gixxer. Those bored with these names can consider RTR 160 4V as it comes in three different variants. Pulsar NS160 now comes with dual disc brakes as standard, priced at INR 85,600 in Mumbai. Honda CB Hornet 160R starts at INR 87,604. If you are looking for a bigger engine, Hero Xtreme 200R, TVS Apache RTR 200, Bajaj Pulsar 220F and Pulsar NS200 are four great options. Xtreme comes with standard ABS while Pulsar 220F is still waiting for the safety feature. 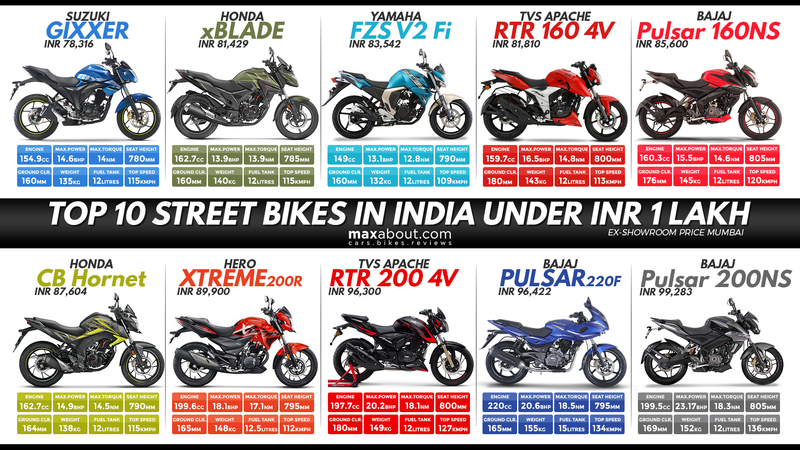 Other two streetfighters are available with optional ABS for INR 12,000 over their mentioned price tags.